Bill Wong is a chaplain at this auto dealership – as well as a machine shop, a testing laboratory, some trucking firms and a farm. Bill Wong keeps in close touch with people working in a machine shop, an auto dealership, a testing laboratory, some trucking firms and a farm. A diverse set of clients, he admits, but the work he does in each working cluster is the same. He is a chaplain, bringing pastoral care and relationship-building services – hopefully with a congenial and sensitive approach – to the employees in each of the workplaces he frequents. Educated and professionally involved as an engineer earlier in life, Bill began working as a corporate chaplain a decade or so ago, after a theological study stint at Regent College. For some years, he worked under the umbrella of City in Focus. More recently, that ministry has scaled back its chaplaincy administrative services, so now he works under the aegis of Corporate Chaplains Canada (CCC), part of Outreach Canada, which is based in Delta. Bill says a typical chaplaincy arrangement involves a contract between the company and the chaplain, through CCC. The contract covers about 10 percent of the cost of a chaplain’s office and expenses. CCC and the chaplain work together to find support for the rest of the program, with CCC providing charitable receipting services as required. The contract with a particular company is worked out the firm’s Employee Assistance Program. “Statistics show that only six per cent of people [in the Vancouver area] ever step inside a church.” That said, it is CCC policy not to proselytize, which means that faith-sharing opportunities can come only at the request of the employee with whom the chaplain is communicating. The following week, I met the fellow again, and he shared about the event and how he and his dad enjoyed it. Since then, we have been able to exchange our thoughts about the Christian faith. I also found out that he is also going to church occasionally as well. 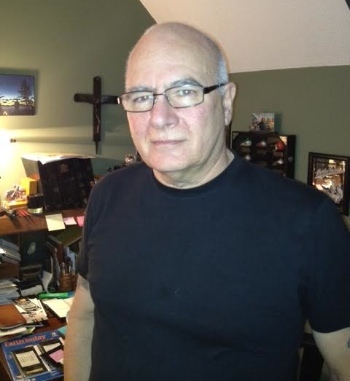 Terry Mahoney is the national director of Corporate Chaplains Canada. 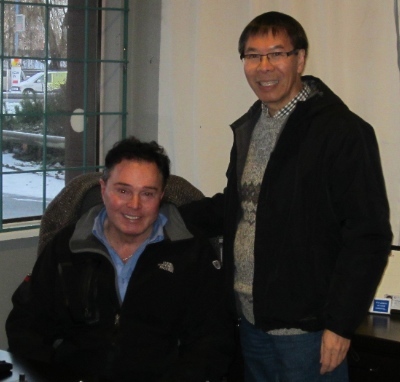 Terry Mahoney is the national director of Corporate Chaplains Canada, the structure under which Bill Wong and 14 other chaplains in British Columbia, Alberta and Ontario do their work. Terry comes from a business and media background, having worked in the Okanagan for 35 years as both a television station executive and associate publisher of an outdoor magazine. A spiritual column he wrote attracted the attention of the people who developed Now TV, a Surrey Christian television station started by New Day Ministries several years ago. He helped transition the station over to Rogers ownership. It was eventually acquired by Vision TV and continues operation on Channel 10. Then, given his enthusiasm for biking, Terry developed a Bikers Church as a spinoff of Christian Life Assembly in Langley. It was that work that got him interested in finding ways for plugging into a specific community – biking, in his case – and eventually led him into corporate chaplaincy work. His Biker Church experience provided a good base for his future in corporate chaplaincy. At first, much of the work involved attending biker rides and getting involved in community life. That led to ministry-type opportunities such as officiating at weddings and funerals, all of which helped to build relationships that would lead to service or pastoral links. Much of his work involves building confidence. That often involves the chaplain “subsidizing” his own work. In Terry’s case, that comes through the fact that he is in his sixties and, with his spouse’s approval, is able to put some of his retirement income into the project. While Terry refers to the idea that contemporary society has become less receptive to Christianity, he takes note, also, of one statistic claiming that only 2.7 percent of the working population is completely atheistic. Terry said that Paul told the Greeks: “You don’t know who he is. I know,” before introducing them to the One who God raised from the dead.